You’re invited to participate in this 2-session class scheduled from 6:30-8:30 pm on two consecutive Thursdays (September 22nd and 29th) in North Vancouver. This Mini Interactive Album is still one of my all-time favourite projects! Every page contains fun things to open, slide, pull, flip, or move. Made from cut and folded file folders and embellished with a variety of printed craft papers, washi tape, and rubber stamping, this booklet is as much fun to make as it is to explore! If you’d like to make this book, join me for a fantastic series of mini-classes combined into two sessions: September 22 and 29th from 6:30-8:30 pm at “Pamdemonium” — a papercrafting studio in North Vancouver. Participants who attend both sessions will receive a total of 5 pages of illustrated, step-by-step instructions that walk you through every step of creating this AMAZING Mini Album and all its interactive contents! You’ll learn how to make the Mini Album itself from file folders assembled in such a way that each page has a built-in side or top pocket. Then, you’ll expand your Mini Album, by adding additional items, such as Pockets, Flaps, Tags, two different kinds of envelopes, and two darling mini booklets. I will walk you through adding three different kinds of pull indicators so people know where to pull out all the cool treasures you’ll have tucked inside your many pockets and hidden compartments. You’ll learn techniques, tips and tricks that will help to make ALL of your papercrafting projects more fun! Your class kit will include instructions, file folders, punches, buttons, fibres and more. You’ll provide your favourite pad of coordinating printed papers or cardstock (any size: 6×6″, 8×8″ or 12×12″), adhesives, scissors, paper trimmer, and embellishments. In the first session (September 22nd), we’ll create the Mini Album itself, and (time permitting) begin some of the interactive contents. In the second session (September 29th) we’ll create two mini booklets to slide inside, pockets, flaps, carriers, tags, and several different kinds of custom envelopes (some from scratch and some using the Envelope Punch from We R Memory Keepers). I will provide the tools needed to make a wide range of pull indicators for all of the interactive pieces, and a huge assortment of fibers (buttons, ribbons, yarns, lace, fabric scraps, and other trims) for you to choose from at no additional cost. Whether you use your Mini Album as a gift or keep it for yourself, you’ll love how versatile this project is! You can use it as a mini scrapbook to honor a special person, celebrate a special milestone, or remember a special vacation. You can even turn it into a recipe book, or an address and phone number book. 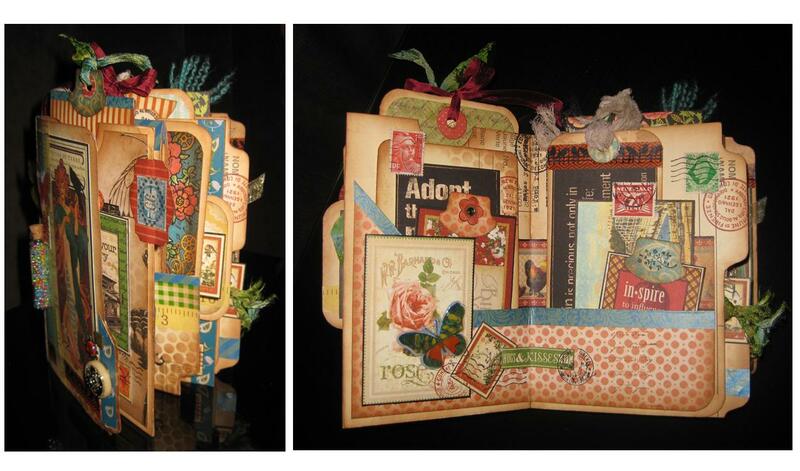 Or you can make it into an art journal. The possibilities are endless! The beauty of this 2-session class is that you’ll learn many transferrable skills that can be used in other paper crafting projects, whether you’re a scrap booker, card maker, art journalist, or mixed media artist. To register for this class, email me at janni.kretlow@hotmail.com. Cost: $50 ($25 per session). Oh my! Would I ever love to take that class. But, the commute from Indiana, USA to Vancouver would be a bit of a stretch. A very generous and fair price for everything you are including. Awesome Janni! So cool! I wish I lived closer. Me too! It would be wonderful to see you.